Oil on canvas. 93 x 111 cm. The portrait shows the French humanist Georges d’Armagnac (1501-1585) with his secretary and life-long friend, Guillaume Philandrier. D’Armagnac was a bishop in Rodez from 1529 and an ambassador in Venice from 1536-1539. Here, he must have become familiar with Titian’s art and commissioned the painting from him. Besides being a personal and atmospheric work, it is interesting how the two men’s status is indicated. D’Armagnac looks neither at the viewer nor at Philandrier. He appears statuary and introspective, which helps highlight his higher status. Philandrier, on the other hand, appears more lively and engaged. He looks at d’Armagnac with a devoted, respectful and expectant gaze. 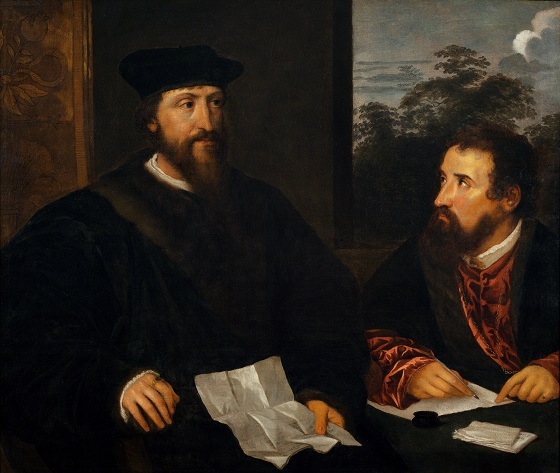 The painting was the first by Titian to enter an English collection. It is known that it belonged to the Northumberland family in 1652. Today it hangs at the duke of Northumberland’s collection at Alnwick Castle. It was copied in the 1600s by numerous artists, both Italian and Dutch, who had seen it there, and this painting is presumably one of these copies.